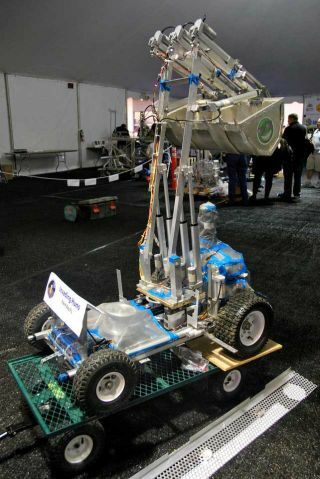 One of the robotic entries to the 2009 NASA Regolith Excavation Challenge, where contestants had to dig mock lunar dirt and deposit it into a container in under 30 minutes. After years of competition, NASA's moon dirt diggingchallenge finally has some winners. Three different teams took home a total$750,000 in prize money by using homemade robots to excavate simulated lunardirt. For the first time in the three-year history of NASA's RegolithExcavation Challenge, teams successfully completed the timed trial during acompetition held Oct. 18 at NASA's Ames Research Center at Moffett Field,Calif. The contest is part of NASA's CentennialChallenges program, which offers cash prizes for technological feats inorder to spur interest and development in space technology. First place went to the team Paul's Robotics of Worcester,Mass., which took home the top $500,000 prize. Terra Engineering of Gardena,Calif. won second place, with a purse of $150,000. Finishing third wasfirst-time competitor Team Braundo of Rancho Palos Verde, Calif., which tookhome $100,000. To win the prizes, competitors had to build a remote-controlledrobot that could dig at least 330 pounds (150 kg) of simulated moon dirt ?called regolith ? and deposit it in a container within 30 minutes or less. Therobots must contain their own power source and weigh no more than 176 pounds(80 kg). "It's really encouraging that we saw three teamsachieve the minimum requirements and shows that innovation is not only alivebut growing," said Lynn Baroff, executive director of the California SpaceEducation and Workforce Institute and leader of the panel of judges. "It'sreally great that through this competition NASA is actively seeking torecognize citizen inventors from across the nation whose ideas may one day contributeto space exploration." Paul's Robotics, the first-place finisher, excavated 1,103pounds of dirt within the half-hour time limit, while the second- andthird-place winners lifted 595 pounds and 580 pounds, respectively. While liftinga pile of dirt doesn't sound like much of a challenge, the simulated lunarregolith, like the real thing, is difficult to dig because the individualgrains tend to stick together. The robot competitors had to be sturdy enough toscoop the regolith and powerful enough to move through it, while still beinglight enough to meet the weight requirements. "This was an incredibly tough competition, and teamscame up with fantastic ideas, some of which might find use in future missionsto the moon," said Greg Schmidt, deputy director of the NASA Lunar ScienceInstitute at Ames. "It's great to have a winner this year. The biggest winis getting so many talented young people involved in NASA's mission ofexploration." The competition was supported by the California SpaceEducation and Workforce Institute and the California Space Authority, the NASALunar Science Institute, Diani Building Corp. of Santa Maria, Calif., andEmpirical Systems Aerospace of Pismo Beach, Calif.